How sweaty can a person get before they get classified as a biological hazard? High humidity, and temperatures in the mid-to-high 30s: this is a sweaty place, and it's not even considered the hot season... (I'm here in mid-June, at the start of the rainy season). 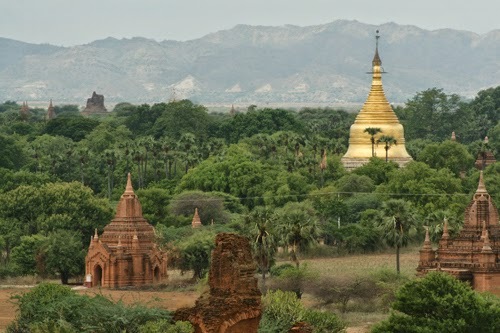 Most tourists these days opt to explore the ruins on small mopeds (disingenuously called "e-bikes" to get around the local law against tourists riding motorbikes). I'm on an old-fashioned bicycle, and it's rather hard work! 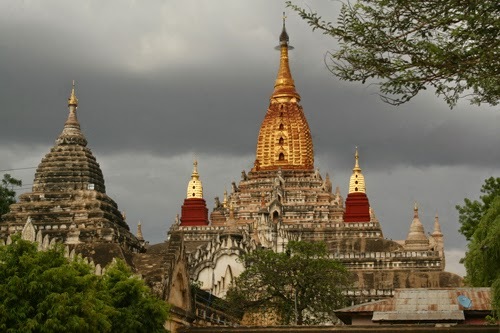 Bagan, on the central plains, is an arid region, although the rainy season has hit, and it's hit hard. Yesterday evening I sat on the porch of my room watching the rain come off the roof like a waterfall. Only a few of the main roads around here are sealed - all the others are essentially sand. when dry, it's soft and your bicycle tyre sinks in if you're not careful. When rainy, it floods and you're cycling through several inches of water. I saw a scorpion yesterday - a dead one, squished on the road. Remind me not to walk off the paths here, will you? And there are these tiny bright red beetles everywhere that look like velvet (a local told me they were called Angel Beetles, and only seen at the start of the rainy season). At least the wild dogs are friendly (you don't get any growling at and following you, like you get in Thailand or Bali). Cycling the tiny dirt backtracks on the central plains, I passed more goat herders (3) than cars (2). 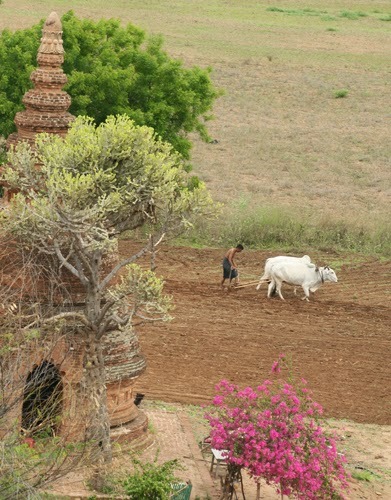 as it's also the start of the rainy season, the local farmers are preparing their fields for planting – they're using oxen to pull old-fashioned wooden plows – I haven't seen a single field being tilled by tractor. It's like going back a century. Despite the lack of modern farming infrastructure in the countryside, it's not all last century. You'll see loads of modern cellphones. Despite the obvious poverty, technology creeps in round the edges. The Burmese are also an incredibly friendly and welcoming people. 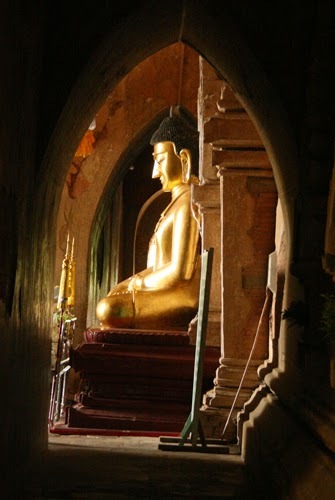 On the road between Shwe-san-daw and Dhammayangyi, I met a couple of youngish (mid-20s) Burmese lads on a motorbike who stopped to give me directions, then escorted me to the temple and walked around it with me. They weren't trying to sell me anything – the one driving the bike just wanted to practice his English. He was taking English classes at Business school while he worked in a hotel, trying to improve his English as his ambition was to travel the world. Nice couple of blokes. Up Shwe san daw (one of the large temples you can climb), a Burmese man in a longyi with a very nice camera loaned me a lens cloth to clean the dust off mine. He didn't speak any English, but noticed me trying to blow dust off the lens and immediately jumped in to help by rushing off to fetch his lens cloth for me. This is still a very poor nation, and her people have suffered through decades of brutal mistreatment, and yet they're still welcoming, still hopeful.